The perfect partner for any stretchings, kaos silicone eyelets are soft and comfortable to wear and they won’t irritate your stretchings. Kaos silicone eyelets come in a variety of bright and bold colours that brighten up your whole look instantly with awesome colour. As they are made from a soft squidgy silicone they are perfect for wearing all the time, even while sleeping as they squash flat under pressure. Although they are soft they keep their shape wonderfully and sit comfortably in your stretching for a perfect fit. As well as funky colours they come in a variety of different sizes from 2.4mm to 25mm. Below I have picked three of my favourite colours that will look awesome on anyone. These silicone eyelets are perfect for people who have stretchings and often wear hats, helmets and headphones. They are highly biocompatible so they are not likely to irritate your stretchings like metals might. As well as bright vibrant colours we have a great range of UV eyelets too. These glow up wonderfully under UV light and look simply awesome when out clubbing. Silicone eyelets are only recommended to wear in healed stretchings, as you would need a thicker sturdier tunnel to stretch. Light weight and thin, silicone eyelets are more favoured to wear to school and work, as they are more acceptable than thicker heavier materials. This entry was posted in Silicone Body Jewellery, Stretched Piercings and tagged Ear Stretching, kaos eyelets, kaos silicone, kaos tunnels, silicone body jewellery, silicone flesh tunnels, silicone stretched ear jewellery, silicone tunnels on June 1, 2011 by Piercing Guru. 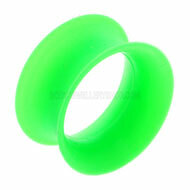 Get yourself a colourful, comfortable new look with our latest range of silicon flesh tunnels! We have two new styles of silicon tunnel that are completely brand new and unique. Silicon is a fantastic material for tunnels because it is soft and highly biocompatible. Instead of a rigid surface, your skin sits against forgiving silicon that will squash and bend with your body. This makes them much more comfortable to sleep in or wear with headphones. These flesh tunnels are also safer in the event of an impact to your ear – they squash down instead of bruising the side of your head. Many people find silicon flesh tunnels easier to insert – the edges are soft and you can fold bigger sizes, so you won’t have to wrestle them in and out of new stretches. These are the first ever jewelled silicon flesh tunnels at BJS. Personally I love them – you get gorgeous bright colours, sparkly gems and a super comfortable feel. This style is also available in white. These flesh tunnels are beautifully made in surgical grade silicon that won’t irritate your skin. They start at just £3.50, so you can afford to get a cute new look. This entry was posted in Ear Piercings, Silicone Body Jewellery, Stretched Piercings, Stretching Jewellery and tagged silicon body jewellery, silicon flesh plugs, silicon flesh tunnels, silicon piercing jewellery, silicon stretched ear jewellery, silicon stretching jewellery, silicone body jewellery, silicone flesh plugs, silicone flesh tunnels, silicone piercing jewellery, silicone stretched ear jewellery, silicone stretching jewellery on April 20, 2011 by Piercing Guru. 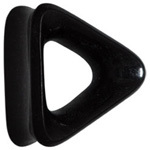 If you have had stretched ears for a while and you want a different look, check out our range of triangle flesh tunnels. Most of us are used to round tunnels but there is actually no reason that you have to stick to just one shape. Triangle flesh tunnels look awesome and they are surprisingly comfortable to wear. This shape does put a little more pressure on your stretching, so I do not recommend them for stretching with, or if you have recently stretched up. I also do not recommend them for cartilage piercings – your cartilage simply cannot adapt to another shape. But as long as your lobes are fully healed and established, they are a great option. They feel a bit weird at first but your stretchings will soon adapt. The most comfortable way to wear them is with the point pointing away from your ear and a flat edge facing inwards. This month we have three brand new silicone triangle flesh tunnels. Personally I cannot wait to try them – the colours are great and they look really cool. I also think that the softness of the silicone will make them even comfier to wear. When you put in a rigid triangular flesh tunnel it feels a bit strange and uncomfortable until your ear adapts. The corners should feel a lot more comfortable and I think your ear will adapt faster too. This entry was posted in Stretched Piercings, Stretching Jewellery and tagged Flesh Tunnels, silicon flesh tunnels, silicon piercing jewellery, silicon stretching jewellery, silicone body jewellery, silicone flesh tunnels, silicone piercing jewellery, silicone stretched ear jewellery, Stretched Ear, Stretched Ears on April 16, 2011 by Piercing Guru.